The study course is now available as a paperback or hardback book and also as a downloadable pdf file. The coursebook is available direct from the printer, and is sent out with trackable shipping. It is available in paperback and hardback editions. Payment can be made by Paypal or Credit Card. Price varies day to day with currency fluctuations. Click on 'buy' button to find up to date price. 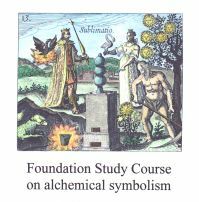 This is a course of instructions and exercises on the interpretation of alchemical symbolism. It focuses entirely on European alchemy. The twenty four lessons are include text and much graphic material with nearly 200 colour illustrations. Lesson One : How to recognise alchemical symbols. Lesson Two : The geometry of alchemical emblems. Lesson Three : Triangles, squares and circles in emblems. Lesson Four : Symbols in opposition to one another. Lesson Five : Resolution of opposites (Male/female). Lesson Six : Resolution of opposites (snake). Lesson Eight : An initial look at Birds. Lesson Nine : Variations between different versions of emblems. Lesson Ten : Animals in the emblem space. Lesson Eleven : The human figure. Lesson Twelve : The Lion. Lesson Thirteen : The dragon. Lesson Fourteen : First steps to understanding emblems as a whole - different types of emblems. Lesson Fifteen : A first attempt at reading some emblems. Lesson Sixteen : Further exercise in reading an emblem. Lesson Seventeen : How not to interpret an alchemical emblem. Lesson Eighteen : Reading an emblem in harmony with the author's intentions. Lesson Nineteen : A short glimpse at sequences. Lesson Twenty : The alchemical process seen as a whole. Lesson Twenty One : Individual alchemical processes. Lesson Twenty Two : Reading complex emblems. Lesson Twenty Three : Reading an emblem from within itself. Lesson Twenty Four : Conclusion. The lessons are self-contained, though it will be best if students read more widely and also built up their own library of alchemical emblems on which to develop their work. This is not a correspondence course and students should not expect me to be able to write to them individually on particular matters, as regrettably I just do not have time to enter into individual correspondence. By purchasing this course on you must agree to use this for the purposes of your private study only and not to distribute the course material (whether text or graphics) to any other individual. Sharing the course with others ultimately leads to my work being pirated and my losing control of my own copyright material. The course is now also available as a download. After you purchase a copy you will be emailed a link through which you can download a personalised copy as a pdf file. If I am in my workshop this can take a little as a couple of hours, but it may take a few days, say over the weekend or if I am not immediately available to deal with the order. Please note these lessons are copyright © Adam McLean, and no part may be reproduced or distributed in any form (including the Internet) without the permission of Adam McLean.